Have you ever watched the classics like Jaws, Jurassic Park, Star Wars, or Twister? Yes? No? Oh really? Well it doesn’t matter because this is nothing like any of those! It doesn’t happen often that a trailer blows me out of my seat – and yes, I mean that literally, in a metaphorical way of course. Really nothing could have prepared me for this trailer, which I would have never even watched if not for the absurdly ridiculous movie poster on the Syfy channel that got me curious. Nothing at all could have prepared me – except of course, watching the first, second, or third movie! I have to say it isn’t often that I get excited for a comedy scifi movie, and not because I don’t like comedy or scifi, because I love scifi and clean comedy is great. The reason I don’t usually get this excited is because there isn’t much that surprises me anymore. 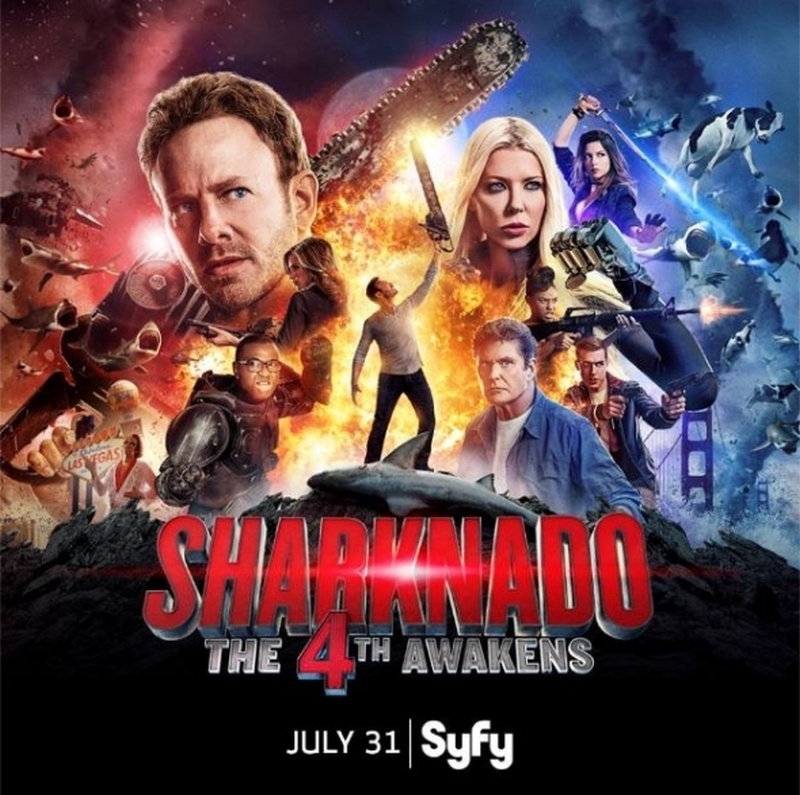 Well, the Sharknado 4 trailer sure surprised me, and in an awesome Monty Python kind of way! Sure, I love a great scifi movie, but this movie is so out of this world, and yes I mean that semiliterally, that it defies the realms of time and space. No, not literally, of course, no movie can actually defy time and space, but the writers of this were clearly totally unhinged, and in a good way; completely freeing their minds and creativity without bounds. Watching this trailer is like watching a comedy writer just do freewriting and just write whatever comes to their mind first and then really do it. Let’s make flying sharks – what!! Yes, flying sharks!! How are the sharks flying? Well you wouldn’t believe me if I told you so just watch this crazy trailer! If you don’t like stupid movies then you probably won’t like Sharknado, but if you enjoy comedies and parodies like Scary Movie (2000), Monty Python Search for the Holy Grail (1975), and The Starving Games (2013), I think you’ll probably love this movie! That said, there have been some really awful parody movies released, such as Date Movie (2006) which is one of the worst movies of all time, but I hope this isn’t one of them. Based on the success of Sharknado (2013), Sharknado 2 (2014), and Sharknado 3 (2015), I think we can look forward to another great shark parody movie. p.s. Right now I’m downloading Sharknado 1, 2, and 3! Can’t wait for 4, hope it lives up to the trailer!